Salmon Magic™, one of Chef Paul´s most popular creations, is a unique blend of carefully selected herbs and spices with subtle accents of dry mustard seeds. These distinct flavors enhance the natural goodness of salmon or any other type of fish, shellfish or seafood. 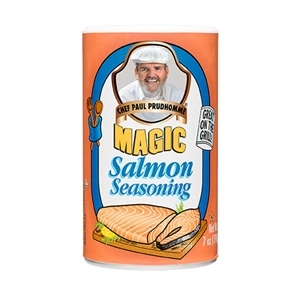 Whether you are grilling, sautéing, baking, broiling or poaching, Chef Paul´s Salmon Magic™ adds just the right flavor to any recipe. Contains no MSG or preservatives, and is Kosher and Halal approved. Ingredient: Sugar, salt, spices, onion, garlic, yellow mustard seeds and paprika.